Entertaining, colourful, fun and mathematically accurate app. 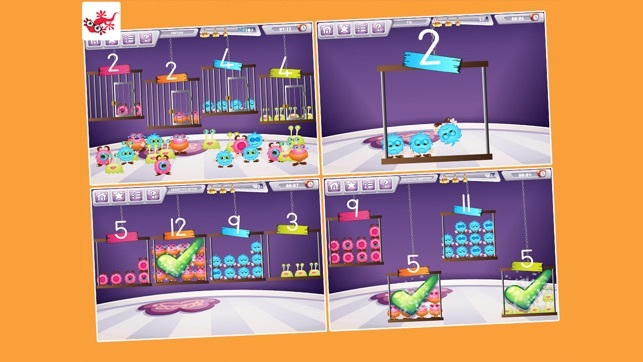 Teach your child the basics of mathematics with this monster-game based app. 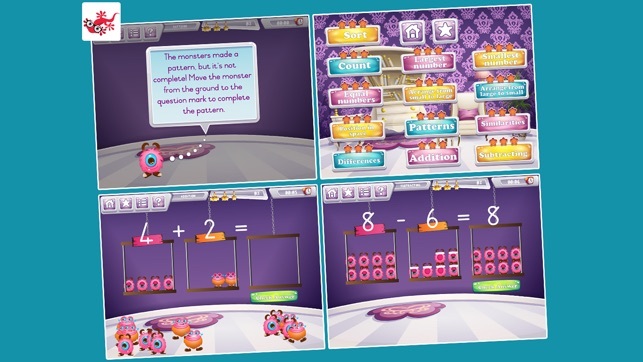 Friendly Math Monsters for Kindergarten is more than just a drag & drop math game with cute, interactive characters - it’s a fun and challenging way for kids, ages 6 and under, to learn and play. 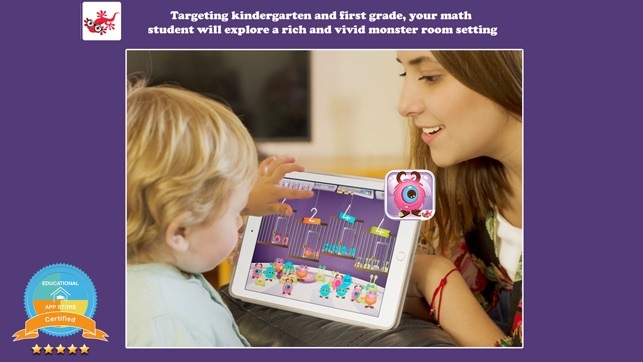 Targeting kindergarten and first grade, your math student will explore a rich and vivid monster room setting, engage and interact with colorful and fun monster characters, all while practicing critical early math skills. Children engage with this app as soon as it is opened: bright colours, attention grabbing sounds and monsters running all over the screen. Upon opening this app, children are offered 5 choices: report; levels; music; settings and the most obvious, play. When the play button is clicked children are taken to the initial level, “sorting”. This level immediately catches the children’s attention with thirty or forty monsters racing from one side of the screen to the other with children required to sort these monsters based on their colour. After this lesson, children are given between one and three stars as an indication of how successful they have been. They are then taken onto the next level, and the next mathematical skill. At any point in the lessons, children can select from one of the four options: home; reports; levels and help. The reports feature displays a list of the thirteen skills available on the app alongside the stars gained for each skill, the percentage accuracy and the time taken. Children can normally work out the skill they need to practice by the number of stars shown, however, it might be helpful for an adult to explain this at the start. The percentage accuracy and time taken are really only useful for an adult, but again this can be explained and used as a motivator for the child. 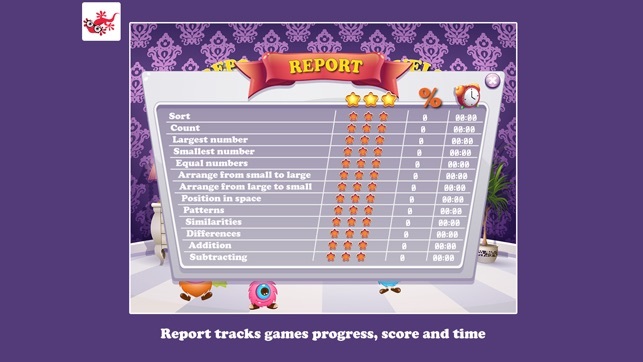 This section allows the child to select the skill they wish to practice, again, understanding is shown by the number of starts in each section. The help section repeats the instructions displayed and spoken at the beginning. Occasionally, the written instructions disappear a second before the speaker has finished - it would be nice to see the instructions displayed for a little longer. Finally the home button returns the child to the home page. From here, children must select which level they want to start at rather than the app automatically returning the child to the position they left off or to where they have made mistakes. It would be nice to see such a feature incorporated to allow children to build on the skills they have already mastered. From the homepage, the additional options include music and settings. Music turns on or off the home page music while settings allows adults to contact the developers, rate or share the app, reset the reports or view other apps produced by the developer. From a mathematical standpoint, this app progresses children through single skills, once step at a time, building on the previous learning whilst retaining a consistent game based environment. Incorrect answers prevent children from accessing the next skill or sub-skill, but are nonetheless recorded on the app. This ensures that children understand and achieve the correct answer, but by recording the incorrect answers and accuracy, children are able to see which skills they need to repeat and continue to practice (as all three stars will not be awarded). Overall, a very well thought through app, a great deal of attention given to the graphics and game play as well as the mathematics behind the game. Certainly worthy of a 5 star rating.